Diablo is the best dungeon crawl I’ve ever played, and despite it’s age, the game is remarkably easy to get into. But you’re about to play it for the first time, you might get killed within the first couple of dungeons and rage-quit early. But with some useful hints and guidelines, that will hopefully not happen. The Warrior is the strongest of the three. If you’re just starting out, your first playthrough should be as the warrior. He is easiest to keep alive because of his large number of hit points and his ability to deliver massive damage and wear the heaviest armor as the game progresses. You will rarely use magic as a warrior, but should beef up your magical attributes when you find your first Healing and Town Portal books early in the game. These two spells will always find some use, and it’s a shame to leave your mana pool unused throughout the game. On the upside, every spellbook or magical staff your warrior finds can be sold, earning him a tidy extra income. He can also repair his items as his unique ability, though he will lower the overall durability of any item he performs this action on. You should never use it. The Rogue is possibly the hardest character to master. She will use the bow as her primary weapon, but this is difficult since enemies will often move around fast enough to avoid her volley of arrows. When they get into melee range, her ranged weapon, though still able to damage enemies, isn’t half as useful. There are some unique bows scattered around the levels, but not nearly as many as melee weapons, so her upgrade opportunities are fewer. And while her magical skills are more potent than that of the warrior, she could never pass for a skilled mage. She can detect and disarm traps, though the usefulness of this ability is debatable since traps are little more than minor annoyances. Only play her when you want a real challenge. The Mage is definitely the hardest character to play for the first stretch of the game, but becomes the most powerful towards the end. 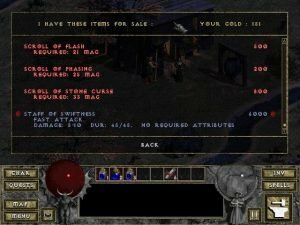 You need to be extremely resourceful when starting out as a mage, being careful to pick up and sell any extra item you find. You need to fuel not only your life, but also your mana pool, and Adria – that no good witch – won’t recharge your mana for free like Pepin does for health. She also takes gold for recharging staves, which you will use a lot as a mage. The incredible range of spells you will learn, however, make this character by far the most interesting. He can recharge staves himself when short on gold, but like the warrior’s repair item ability, this lowers the overall charge count, and should be used rarely or not at all. This game doesn’t let you run, so it’s essential to advance slowly into uncharted territory and kill every monster methodically. You otherwise risk being swarmed, and if you’re a rogue or mage, this can have fatal consequences. Each character has a certain weapon proficiency, which is to say they swing one class of weapon faster than others. The warrior, for instance, will swing an axe faster than the mage. This translates to the warrior being able to deal more damage per minute than the mage can with the same item. In combat, victory often goes to the swift, not the strong. When attacking a foe that does large amounts of damage quickly, like the Butcher, use faster weapons. When shopping for trinkets, look for items with fast attack and fast hit recovery. Every time you hit your foes you abort their action; the same goes for you. So the faster you strike, the fewer chances they will have to strike back. Fast hit recovery is excellent when you are swarmed, letting you continue to put down critters even when taking multiple hits. Remember that you can leave your items scattered around town (or the dungeons) and they will never disappear. You can’t do this in multiplayer of course, but in solo mode, it lets you do useful things . For instance, you can have virtually limitless gold storage! Just drop them in 5000g increments nearby. You should also keep items you think you might need later. Have a helm that gives you 10 Magic? Keep it for later, and if you find a powerful spellbook, use the helm to boost your magic beyond the minimum requirements. Remember that Adria randomizes her stock each time you reload. Simply save and load until you find the best spellbook or staff for sale. This trick doesn’t work with Griswold. You can keep your character from moving when attacking by holding the Shift key. This is vital if you’re playing as the Rogue. Simply hold the Shift key and click on any direction to fire your longbow from a standing position. This trick is also useful for the Warrior when fighting the Hidden, who can turn invisible and often try to flank you. Kill everything everwhere. Earn every point of experience, since you want to have the strongest possible character when facing Diablo in Hell. The last level is hard because Diablo is surrounded by swarms of bad guys that you could kill easily one-on-one, but in such large numbers they’re difficult to handle. Diablo himself isn’t too bad if you can position two players close to him and just start whacking away. If your hits are strong enough, he’ll be stunned by them just like any other monster, and with two players going at it he’ll not be able to move and hit back. But if he does move — boy, does he pack a punch. In any case, bring emergency Town Portal scrolls with you and be prepared to bail. Most of the quests are straightforward, but a few merit special notice. To find water for the poisoned well quest, look for an interior room with no entrance. You will find a crack with some lamps around it. Move your cursor over it until you get the entrance message. To solve the bloodstone quest you must touch the altar with the bloodstone you pick up (do this by leaving your inventory screen open and clicking on the bloodstone). This opens another room holding some horned demons. In that room, you will find another bloodstone. Take it back to the altar and touch it again. This will open yet another room with more demons. As the dust settles from their demise, another bloodstone is revealed. One last time, touch the altar, kill the demons and collect Arkaine’s Valor, the best armor you are likely to find for a long time. Shrines are purposefully cryptic. You can sometimes notice what they did if you look closely at your stats or inventory, but other times they are so obscure that you can walk away clueless of whether activating it had a beneficial or detrimental effect on your character. So then here is a complete list of Shrines and their effects. Multiplayer Diablo is very different from singleplayer mode. You can start as a new character and jump straight into a game even if you don’t have an internet connection. Since multiplayer games respawn each time you re-enter, you can level up fairly quickly without exposing yourself to much danger. If you’re looking for online play, try hosting a game on Gameranger and you might get lucky and find another player. Levels (Church, Catacombs, Caves, Hell) become unlocked according to your character level. 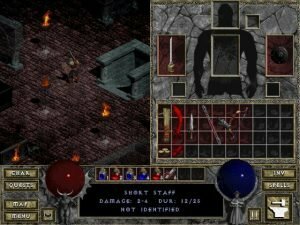 There’s no party system in Diablo 1, however, and if a much stronger player is really inclined to ruin your day, he can just attack and kill you and steal your gear. Most players, fortunately, have the common courtesy of challenging you to a duel before fighting. Some, like myself, help out scrubs with gold or quality items. The good news is that the original Diablo 1 is easy to trick. You can simply make a copy of your character profile located in your game folder. Everything you had will be ’frozen’ to that character profile, which you can store for later use. This can also be used if you want to help out a party member with some of your unique items or gold. Simply copy your character profile, give him your stuff, exit the game, replace your new character file with the old one, and you will have everything back.